If you're a student, you've probably used Google to look up information about colleges and universities. You've also likely noticed that most, if not all, schools have their own personalized cards with figures such as acceptance rate, tuition, total enrollment, and endowment. Now, Google is partnering with the US Department of Education to integrate statistics from the College Scorecard into Google Search. In case you didn't know what the College Scorecard is (I didn't), it's a website that contains a college search tool and "nearly 2,000 elements for more than 7,000 institutions, dating back 18 years." In other words, it could be a major assistant for high school students who are applying to college in the near future. 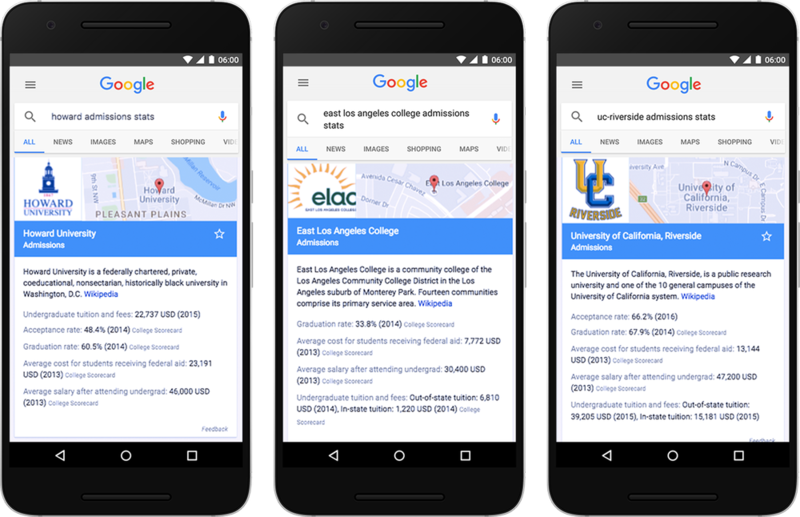 The College Scorecard's data can already be found in Google Search on both mobile and the web. To see this for yourself, simply search "[name of college] admission stats." (Oddly, swapping "stats" for "statistics" doesn't trigger the card.) There, you'll be able to see the figures that College Scorecard has provided (graduation rate, average cost for students receiving financial aid, and average salary after attending undergrad).